In a good compost heap all (harmful) elements are degraded. 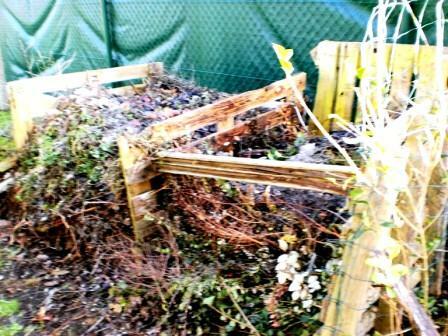 In a compost heap you put all your waste and scrap of organic material, preferably with a lot of variety. Also ashes (of bone and wood) and manure can on it. Mature compost is fine fertilizer. The plant remains are almost broken to dark humus (Latin for Earth). Also this waste process is a food chain, from small to large, eat and be eaten. First come fungi and bacteria, then nematodes and springtails, then larger species, predatory nematodes and mites. Nematodes look like a mini eel from 0.2 to 2 mm long. Few dozens of the 14,000 species are harmful, if there are too many of them present. White worms (Enchytraeidae) are white, 0.5 to 4 cm long. They like soil, manure, compost and plant debris. Worms are a blessing to your soil. Red digest fresh material, gray (Aporrectodae calliginosa, Lubricus terrestris...) promote with their tunnels the structure of the earth, good for aeration, rooting, water supply and drainage and soil life. A living soil has lots and winding tunnels. Straight, narrow passages indicate that the worms found noting attractive in the lifeless layer. Many earthworms indicate a good soil. So be a good host for earthworms. The manure worm (Eisenia foetida) is dark red with yellow orange horizontal stripes (also called red- and tiger worm). He lives on the surface, in the leaf litter. The earthworm (Lubricus terrestris) digs up to 3 meters deep, the red worm (L. rubellus) digests fresh material. A crumbly, compost rich soil gives plants food, moisture and hold. (Too) hard or solid (driven) (under) soil prevents rooting and water permeability. Phase 1: bacteria break down organic matter, producing ammonia and heat to 55-70°C. Weed seeds are neutralized. Oxygen is consumed and water is evaporated. The thermal process in a compost pile creates nitrogen loss through ammonia ventilation. 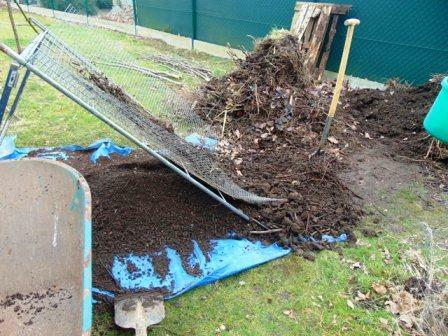 You can limit the loss by covering the heap with soil or mature compost. You can mingle the heap (regulately) to provide him with oxygen and to accelerate and pass off (for the outer layers) the process. Also give water. Too much water = too little oxygen. Phase 2: The heap cools, mold and air penetrating from the outside in hope. Phase 3: springtails and manure worms make their appearance. Phase 4: soil worms replace manure worms, animal life explodes. The compost is ready. The whole process is a bit like the evolution of life on earth. In addition to the high compost heap, you can make a low scooper for the chickens in which you temporarily deposit weeds and pruning. The geese also love it. Mix brown (dry) and green (wet) material. Rather no thick layers of just grass or leaves. They compact, acidificate and close the heapes of air. Add occasional lime, in the building of pile. There arise many acids during the conversion, care for balance. Make the heap in the shade so it does not dry out. No cabbage stumps with clubroot disease on the compost heap, these persistent fungus survive the process. If you throw compost through a coarse wire sieve for use, you can use the residual fraction to re- launch the new compost heap. Herein are still useful bacterial colonies. Purchased flowers (also with eco-like labels) you better don’t throw (for the chickens or) on the compost heap, but with the residual waste due to too many fungicides e.a. I have a frame of about 1 x 2m with thick gauze stretched of approximately 2 x 2 cm. I put it solid, oblique (45°) in addition to the compost heap and throw compost with the fork on top of it. What drops trough, is done: sieved compost. What rolls down sometimes gets a second chance, and otherwise goes back to the new compost heap. I did this also even though bedsprings: metal bed frame with spring grid on which a mattress can be laid. For finer sieve work you can use a ash sifter. Or even look at a greengrocer for plastic crates with a grid floor. There are also ingenious, tapered rotary drums (similar to a metal mesh wastebasket) that fit into a wheelbarrow and can be rotated . Sieved compost falls through, and the coarser fraction is coming to the end (or opening) of the drum. Plants need nitrogen (N, also the main component of fertilizer and air: 78% N and 21% oxygen). Micro - organisms use themselves carbon (K) and nitrogen (N) to convert organic material. It comes after their death again free for the plants. Not riped compost consumes the nitrogen that plants need! So use only matured compost as fertilizer. Nitrogen (producing) bacteria cannot function and live in an already with artificial nitrogen fertilized soil. On the pale, light green color, you can see that plants don’t have enough nitrogen and vigor. You make excellent black compost or potting soil from tree leaves. Oak leaf is acidic and goes very slowly. The acidity of all good ripe compost is between 7 and 8 ph. Oak leaves must therefore be composted for years. Deciduous forests did lust for centuries.